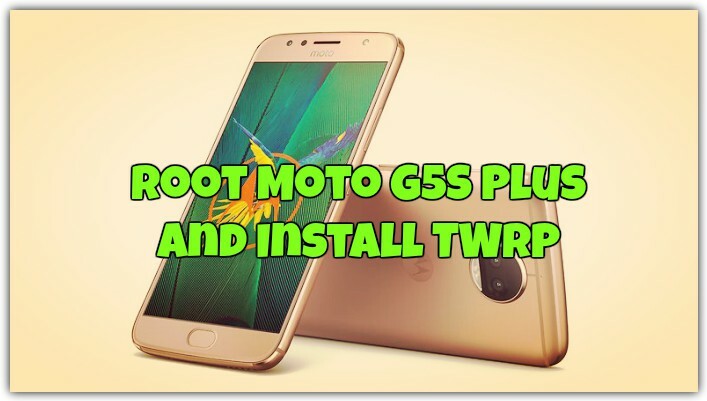 If you recently bought the new Moto G5S Plus Android smartphone and now looking for the complete guide to root Moto G5S Plus and install TWRP custom Recovery, then you are at the right place. Today, here in this tutorial we are going to show you how you can easily install the custom TWRP Recovery on your Moto G5S Plus and root the same with the help of Magisk Manager. Once the phone is rooted you can do lots of thing on your phone like install custom ROMs, install Xposed framework and do lots more things. Check out some of the benefits of rooting android phone here. The guide below will help you install the TWRP recovery on your Moto G5S Plus and root the phone. The guide is a little bit longer but not so hard. All you have to do is first unlock the bootloader of your Moto G5S Plus. After that, you have to flash the TWRP on your phone with the help of the ADB commands and in the end, you need to flash the Magisk file with the help of TWRP to root Moto G5S Plus. This guide is only for the Moto G5 Plus and don’t follow the below mention steps on any other Moto phone. Technobuzz.net is not responsible for any damage that might happen to your phone during this process. You’ll lose all your data upon unlocking the bootloader. Read all the instructions very carefully and follow all the steps one by one on your phone to successfully root Moto G5S Plus. And make sure that your phone is fully charged and do take the full backup of your phone because unlocking bootloader will wipe all the data from your phone. Download the TWRP recovery for the Moto G5S plus here and save on your desktop. Download Magisk zip and Magisk Manager here and save on your desktop. As we already mention above that to install the TWRP first you need to unlock the bootloader of your phone. 1. Download the TWRP recovery from above downloads. And save the TWRP file in the ADB folder that you created while installing the ADB drivers on your Windows PC. 2. Now Connect your phone to PC with a USB cable. 3. Now Open the ADB folder in which you saved the TWRP file, and then in the address bar, type cmd and hit the enter key. A command window will open on your windows Screen. 4. Now you have to boot your phone into fastboot mode. To do this enter the following command and hit enter. 5. Once your phone in the Fastboot mode. Enter this command to install the TWRP on your Moto G5S plus. 6. Now the TWRP will be flashed on your phone. Once you are in the recovery, it will ask your permission for ‘Swipe to allow modifications for /system’. DO NOT ALLOW it. 1. Download the Magisk zip file and Magisk Manager APK from the above mention links. 2. Now save both files on your phone and boot your phone into TWRP recovery mode. 3. Once you are in the TWRP recovery, Go to the Install and select the Magisk zip file. Do Swipe to Confirm Flash on the bottom of the screen to begin the flashing process. 4. After it is flashed, go to the Reboot System Option. Select it. 5. Once your phone is booted. Open a file manager app and locate the Magisk Manager apk file that you saved to your phone in Step 1 and install it. 6. Open the Magisk Manager app and check for your device’s root status. So with this quick guide, you can easily get the root access on your Moto G5S plus. Do let us know if you need any help with this.